Spetses is a beautiful island, with a very picturesque old harbour East of the town centre, lined with old Venetian mansions. The town centre surrounding Dapia harbour offers a variety of shops and boutiques, in addition to many cafes and tavernas. Spetses continues to encouraging the use of traditional horse drawn carriages and bicycles, but has created the nuisance of numerous noisy motorbikes. The best way to see the town is to walk, or hire one of the traditional one-horse carriages found by the waterfront. To get around the island, you can rent quad-bikes, mopeds or bicycles. Motorbikes cost approximately 15 Euros to hire per day, bicycles cost 5 Euros to hire per day, and a bus will cost 3 Euros per person to get to the popular sandy Aghioi Anargyri beach. Spetses was the first Argo-Saronic island to participate in the 1821 War of Independence, Hydra soon joining forces with them, having around 55 merchant vessels which were converted into well armed warships. The firing of the Turkish flagship in the great naval battle on 8th September 1822 prevented the Ottoman fleet from bringing supplies to Nafplio, which then surrendered to the Greek besiegers at the end of November. The retreat of the enemy fleet, superior in numbers, is attributed to the courage of Kosmas Barbatsis, the daring man who fired the Turkish flagship, an act which essenttially decided the outcome of the battle. A large bronze statue of Barbatsis stands within a gun-enplacement overlooking the sculpture park, near the famous lighthouse (pharos) of Spetses. Two of Spetses elegant old mansions are still the property of descendants of Laskarina Bouboulina, who was the courageous lady admiral, whose warships vanquished the Ottoman fleet during the Greek War of Independence, she is still one of Greek history's greatest women. Bouboulina was tragicaly killed on the island of Spetses, following a family dispute, and her bones are kept in the Spetses Museum nearby. Bouboulina's Museum is located just behind the harbour front. The museum offers daily guided tours of the large pebble-paved courtyard and the mansion interior, with its lavish decorations, wood carved Florentine ceiling in the great hall and a few mementoes of the heroine herself, including a large scale model of her 1821 flagship, the 'Agamemnon'. Along the waterfront, there is a large bronze statue of Laskarina Bouboulina in Poseidonion Square. The remarkable mansion of Hatziyannis Mexis, one of Spetses' most powerful statesmen and the first governor of the island, houses the Spetses Museum (open from 8:30 to 16:30 daily, closed Mondays) This museum houses the archaeological, historical (mementoes of the Revolution) and folklore collections of the island. King Othon, the first king of independent Greece, stayed as a guest in this mansion during the period when his first capital was Nafplio. Poseidonion Grand Hotel (pictured above and right) has been a landmark on the Spetses skyline for over a hundred years with its exceptional architecture. The hotel first opened in 1914 and was the brainchild of Sotirios Anargiros, who was responsible for much of Spetses’ early development. The hotel represented the cosmopolitan face of the island and quickly became a favourite destination for international high society, royalty and wealthy Athenians. The Poseidonion reopened its doors in 2009 following a meticulous five-year restoration, which has brought it up to date, while carefully preserving the original style and architecture of the classic building. A large bronze statue of Laskarina Bouboulina stands proudly in front of the Poseidonion Grand Hotel in Poseidonion Square. Spetses Classic Yacht Race takes place in June. A spectacular weekend of Sailing races, starting and finishing in the narrow straight between Spetses and Kosta. Over 50 yachts took part in a recent Regatta, with categories for 'Vintage' (built prior to 1949), 'Classic' (built between 1949-1975) and 'Spirit of Tradition' (built after 1975) as well as Aegean schooners and open boats. Anargyri Art Festival takes place during August on Spetses, with the focus on performing and visual arts. Festival of Armata (Armada) takes place on the second Saturday evening of September, starting at approximately 22:00. The special event is a reconstruction of the great sea battle against the Ottoman Turk, Algerian and Egyptian fleet in 1822, that took place just East of the original old harbour of Spetses. For the build up, there are marching bands, stage music, song and dance in front of the Poseidonion Grand Hotel, followed by a torchlight procession to the Dapia harbour. The highlight of the evening is the re-enactment of the attack and fire-bombing of the Ottoman Turkish flagship by the local hero, Kosmas Barbatsis (pictured right). As the Ottoman flagship explodes, burns and slowly sinks, there is a grand pyrotechnics firework display for the finale, lighting up the dark starlit sky. Spetses Mini Marathon takes place in October. The main event, which started in 2011, is an international 26kms marathon around the island. In 2014, a 10km race was added to the programme. Swimming races of 2.5km and 5km as well as a childrens 1000m run and swim race are also part of the 3-day programme of events. Over 15,000 runners took part in the 5th annual Spetses Marathon in 2015. The 2019 dates: Friday 4th - Childrens run and swim event. Saturday 5th - Swimming events to/from Kosta and 10km running event. Sunday 6th - 5km running event and the 26kms Mini Marathon. A 30 minute drive to Kosta, along the scenic coastal route or on the main Kranidi by-pass via Porto Heli. There are many parking facilities at Kosta, either on the nearby roads or in official, secure, shaded car-parks, which cost approximately 5.00 Euros per day. Please note: Only Spetses residents, with valid permits for their cars, and licenced commercial vehicles are allowed to cross over to Spetses by ferry. Tourist hire-cars are not allowed onto the ferry although motor bikes and bicycles are allowed. Be aware that the Police issue parking tickets for vehicles parked on the stretch of road leading down to the port. From Kosta there are various boats which depart for Spetses island, some costing as little as 2.50 Euros per person one way. The quickest way to reach Spetses would be to catch a fast water taxi, direct to the Dapia harbour. Cost approximately 23 Euros per journey, irrespective of the number of passengers. Journey time is approximately 5 minutes. In the high Summer months and festivals periods only, you could consider taking one of the traditional motor caiques, which sail throughout the day as soon as they are full. Cost is only 2.50 Euros per person, one way. Journey time is approximately 10 minutes. The other economical way would be the large Katerina Star ferry-boat, sailing at 06:50 - 08:00 - 10:30 - 13:30 - 17:00 from Kosta. Return sailing times from Spetses at 06:00 - 07:20 - 10:00 - 13:00 - 16:30. The Katerina Star ferry-boat takes Spetses residents vehicles only (no private or rented cars allowed on the island) as well as commercial vehicles, motorbikes, bicycles and passengers. Cost approximately 2.50 Euros per person, one way. Journey time is approximately 20 minutes. Be aware that the last Katerina Star ferry-boat sailing from Spetses to Kosta is at 16:30. From 2018 there is a new way to sail across to Spetses, with the Spetses Express I passenger boat. Sailing at 09:30 - 12:00 - 15:00 - 19:00 - 20:00 from Kosta. Return sailing times from Spetses at 09:00 - 11:30 - 14:30 - 18:30 - 19:30. Cost is 3 Euros per person, one way. Journey time is approximately 10 minutes. Additional sailing times will come into effect from June. Catch the bus from Ermioni to Kosta from 09:30, via Kranidi and Porto Heli, Monday to Friday only. The bus stop in Ermioni is opposite Pop's tourist office, next to the kiosk. Cost approximately 3 Euros per person. From Kosta you have a choice of which boats to catch for the crossing. Check with the bus driver for the return journey times from Kosta to Kranidi/Ermioni. 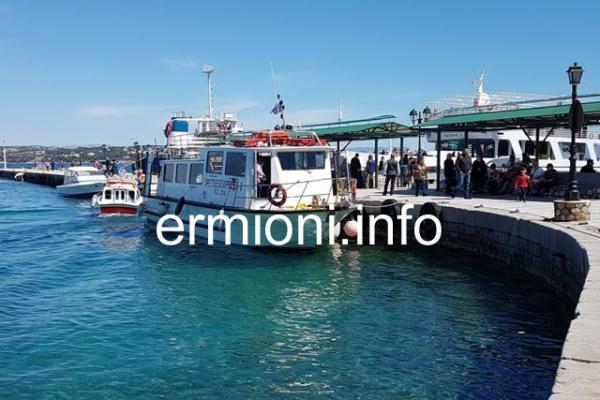 Last bus from Kranidi to Ermioni is at 13:10. Taxi from Kranidi to Ermioni costs approximately 15 Euros. Sailings on most days by Flying Dolphin & Flying Cat, from Ermioni to Spetses direct. The times of departure and return are limited. Please check hellenicseaways.gr/en sailing times prior to departure, or contact Pop's Tourist office in Ermioni, Tel: +30 27540 31514. The sea crossing from Ermioni to Spetses is approximately 25 minutes. Tickets cost 8.00 Euros per person, one way. Always check sailing times prior to departure, especially during public holidays, as Hellenic Seaways can change or cancel sailing times without notice.